I love this picture. My husband took it of an old highway tunnel. 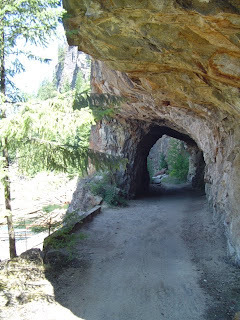 The highway is no longer used but the tunnel remains and the old highway is used as a hiking trail now. If you could see off to the left you'd see a beautiful lake. We always yell and shout when we go through this tunnel trying to hear the echo. Such simple pleasures. Here's my kids as they walked through the tunnel. I used to tell them it was a magic tunnel and when they came out the other side they would be in a magic place. They never believed me even though I knew it was true. Doesn't this look like a magic place? I think so too. The wildlife is pretty cute too. Well I guess 'sucky' is a bit too strong a word but it rhymed with Sunday. It's been hot and sunny until now. There is an actual breeze out there and now the clouds have rolled in so it's not as hot this evening. Maybe we'll get a bit of a storm. I love a good storm. We put he air conditioner in the kitchen window and now we're back to looking at this! The neighbours are hanging out their laundry again, only about 4 ft from out window. 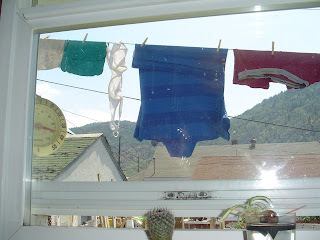 I just wish they would hang their undies somewhere away from our window. This is definitely not what I like to see first thing in the morning. They hung sheets up there today and the wind was blowing the sheets right up against the air conditioner. I was worried the sheets may be sucked into the unit but so far this hasn't happened. Another weekend is almost under my belt. I've spent most of my life as a mother on my own every weekend with the kids. At first it wasn't so bad but after 14 years of it I need a break. I think I'll leave the kids on their own and go out shopping tomorrow. Unfortunately what I'll be shopping for is supper. I have to make supper, the most dreaded chore on my list. I'm not sure when I started to hate to cook meals but most likely sometime when I became a mom. Try to cook anything with a screaming baby or whining toddler or both isn't my idea of fun. And on top of that my daughter is the most picky eater on the planet. So it's not like I can just toss any old meal together. I have to make something she will eat. I'm too tired for that. I want to throw a sandwich in my own mouth and be done with the whole thing. Eating has never been high on my priority list. And yes, I'm aware that it should be. I heard some women today talking about menopause. They looked to be mostly in their 40's or late 30's. I'm not sure why women can't seem to get this information straight. So just in case there is a female reader out there here's the info. When your period stops for a year you are said to be in menopause. If you are having a period you aren't going into menopause or beginning menopause. The lead up to menopause is called perimenopause not starting menopause. That's how I feel today. The kitten won't let me sleep at night. I don't have a wall or door in my room so I can't just shut him out. My husband in his infinite stupidity has left a sheet for a wall for going on three years now. Yes, I am a patient woman and have waited for him to get off his rear end and fix this problem but he hasn't. I am always the one paying the price for his stupidity. He goes to bed at 10pm and of course the stupid cat stays downstairs with me until I go to bed so he never bothers the husband. The kids both have doors on their bedrooms and wisely close them. When I go to bed the kitten decides it's a great time to have a big old poop in his litter box. Did I tell you his litter box is only about 10 feet from my bed? No, well it is. It's almost Father's Day and I only have one gift and that's for my dad. The kids and I haven't got to the mall to buy the husband a gift yet nor has the husband bothered to buy his dad a gift. So tomorrow the kids and I will go on a quest to get the perfect Father's Day gift that doesn't cost much money. The husband did something so stupid that I'm in shock over it plus it cost us $200. No need of details just know it was his own stupidity that cost us that money that we don't really have. He took it out of our renovation money. He's been slowly drawing money out of that account because he hasn't been working enough to pay the bills. If I have to spend another summer upstairs in a room with a sheet for a wall and my pillow only 10 feet from a stinky cat box I'm going to strangle him in his sleep (not really). Maybe I'll just use a permanent pen and draw things on his face instead. I can't be arrested for that! HA! I just received my second apology this week. Seems when I was mouthing off I was actually in the right and these people were over the line. Now I don't feel so bad for going off on these people even though I wasn't intending to. I guess I was angry and upset with them and was trying to ignore that. Usually I just let that kind of thing slide and sooner or later I'm not angry or upset. If something continues to bug me I'll do something about it in a less confrontational way but this past week I just went off on people and it kind of scared me. I felt like my mouth was doing stuff without consulting my brain first and I didn't like that at all. Of course I accepted the apologies and am moving along, not going to hold a grudge, why waste my life doing that? I'm good at not holding grudges, it's one of my best qualities, being able to forgive. I don't know what is wrong with me lately but every time I open my mouth I'm saying something I shouldn't be. I've never done that before at least not to this extent. It's like I can't control what comes out of my mouth anymore. I think I'll either have to duct tape my mouth closed or stay locked up at home if this keeps up. Everyone that knows me will be outside with pitchforks and torches if I can't stop shooting my mouth off. I'm not the kind of person that will give you an ear full. I'm a pretty shy person who doesn't like confrontations. I'm a Libra. Even if you don't believe in astrology my personality is very Libra in that I'm a peacemaker and solution finder not a fighter at all. Kitten and cat photos to make you smile. Here he is hanging out on the windowsill. Take note of the snagged sheers. I'll have to replace them once he gets out of his kitten hood. Can you see a bit of a size difference between these two? That's as close as our orange cat will let him get to her. Too bad cause he'd love to play and snuggle with her but she's having none of it, at least not yet. And here you can see the annoyance in our orange cat by the tilt of her ears. The kitten is lurking behind stuff and when she walks by he jumps out and bats at her. She's hissing and growling at him lots but he stays away from her except from some sneak attacts. These two are my amusement. Another family crisis. My nephew has overdosed on some type of recreational drug and is in the ICU. He is expected to recover but he's sedated right now while they wait for the drug to get out of his system. It wasn't a suicide attempt just stupidity. He's only just turned 18 and still lives with his parents. He didn't graduate from high school due to the fact that he most likely has ADD. His dad would never let him be tested even though he's shown signs of having some kind of problem since he was 3 years old. There isn't much we can do for him because his parents refuse all help even though my older sister is a social worker and I have a degree in psychology with training in substance abuse and family therapy. Our advise is not wanted. My younger sister has been brainwashed by her church to believe that the man is the head of the family and she will not go against her husband's wishes even it's for her own child. Sad. I am sooooo ready to quit that stupid board that I'm on. I had worked really hard on this one project to get it ready for next fall. I don't have time to implement the project so had asked for someone else to take it on. Of course Fat Hitler (used to be little Hitler) says she can do it. Well she takes it over and changes everything that she told me to do in the first place. Why tell someone to do something and then change it all? This woman needs serious mental health! She weighs about 400 lbs (I'm not exaggerating either) and doesn't have a job because no one can stand her long enough. In the 4 years I've been on this board this woman has gone through almost as many jobs. She couldn't even work at WalMart for goodness sakes!